When Halloween rolls around, folks dust off their scary picture books (they keep any season-appropriate spider webs intact) and get spooky with the littlest horror fans. When all the candy's been unwrapped and munched, the picture books get packed away with the styrofoam pumpkins and glitter skulls. Publisher's Description: In this Caldecott Honor-winning picture book, The Twilight Zone comes to the carrot patch as a rabbit fears his favorite treats are out to get him. Jasper Rabbit loves carrots--especially Crackenhopper Field carrots. Celebrated artist Peter Brown's stylish illustrations pair perfectly with Aaron Reynold's text in this hilarious picture book that shows it's all fun and games...until you get too greedy. Publisher Description: After nine lives, Skeleton Cat is back for his tenth. And he has big dreams: to be a drummer. So he rattles and shakes his way through town to find the perfect band. And this phantom cat cause quite a hilarious scene. Kristyn Crow's punchy beat, rollicking action, and clever rhyme paired with Dan Krall's ghoulishly charming art makes Skeleton Cat a perfect, catchy read-aloud for all ages. Publisher Description: Give me my bone! When a teeny-tiny woman finds a teeny-tiny bone in the teeny-tiny village churchyard, she takes it home to boil for her teeny-tiny supper. She never expects the bone will object. 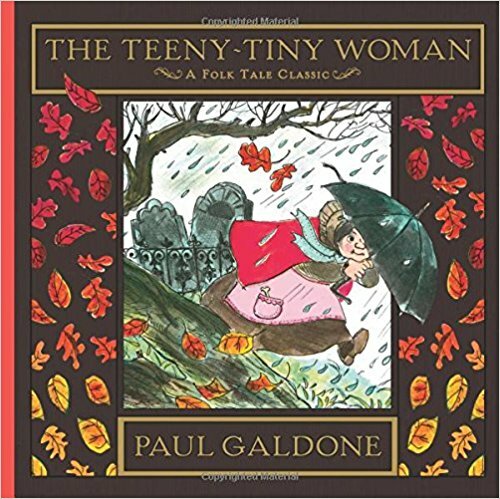 This old English ghost story, retold and illustrated with singular wit by Paul Galdone, is spine-tingling, funny bone-tickling fun. With hidden details to discover in the illustrations and plenty of repetition in the text, young children will enjoy joining in on this read-aloud. Now part of the Folk Tale Classics series, with gold foil stamping on the cover, this one is sure to become a story time favorite at Halloween or any time.